Earlier this afternoon, I was delighted to welcome approximately 75 teachers, district curriculum specialists, and content experts from across the state to the start of a four-day standard-setting meeting for Biology I and Geometry EOC assessments and FCAT 2.0 Science. Guided by experienced psychometricians, participants will spend their days reviewing statewide content requirements to help define what students should know and be able to do in each of these subject areas. They will identify expectations for teachers, students, and parents. And they will focus on improving teaching and learning for Florida students that will help them develop the skills necessary to compete in a global society. Standard-setting is integral to how we measure what we are doing within our education system. Having content experts from around the state who work with their students and their geographic area helps us make decisions that can be consistent statewide. Next week, we will have a reactor panel that will do exactly as the name suggests. The panel will include people from the community, businesses, and education who will spend two days considering the impact of the recommendations from the content experts and then make their own recommendations. The public will be invited to provide their input at rule workshops across the state and on our department website. Eventually, all of the recommendations go to the State Board of Education for action. Today Governor Scott and I met with Principal Couvillon of Fort Walton Beach High School to kick off our Education Listening Tour visit. Although the weather was less than desirable, the teachers and students were very excited and welcomed us to their school. We met with approximately 20 teachers in two groups and discussed their thoughts on accountability. While they agree with measurement and accountability, they want to be sure it is as fair as possible. They also expressed concern over the testing window and while they understand that it is necessary in order to have time to get all students on the computer for testing; they expressed frustration at having to get standards taught as much as six weeks before school is out. After meeting with teachers, we visited an American government class where several students asked very thoughtful questions about education, funding, and jobs. During yesterday’s Education Listening Tour visits to Lexington Middle School and Madeira Beach Fundamental K-8 School, both teachers and parents were very open with Governor Scott. Many attendees remarked on how comfortable his humble manner made them feel while voicing their concerns; they really felt like they were being heard. While discussing the education system and what improvements were needed, the Governor also asked for solutions. Many took advantage of the opportunity and provided great responses, while others wanted to do a bit more research and respond on the Governor’s website. The parents and teachers of Lexington Middle School and Madeira Beach Fundamental had great ideas and are looking forward to increased communication with the State. Governor Rick Scott and the Deputy Chancellor for Educator Quality, Kathy Hebda participated in the 9/11 Commemoration ceremony at Boca Raton High School, and Governor Scott recounted his personal experiences on that day. The school’s JROTC and chorus provided a moving and dignified memorial to those who died and those who lost loved ones that day. 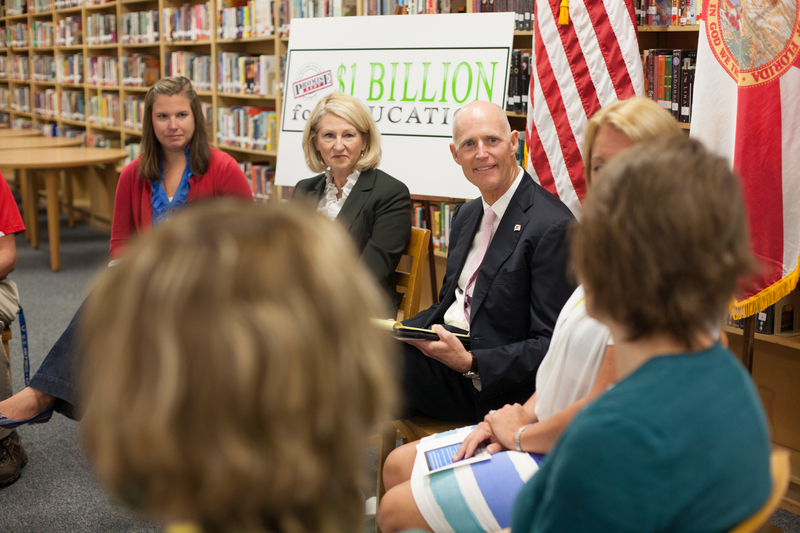 After the ceremony, Governor Scott and Kathy met with students, teachers, and parents to discuss the rising cost of college tuition. During the discussion, a teacher referred to the cost of text books that are paid by the district and how much the same books cost online. Teachers affirmed that they want to be sure that they are evaluated fairly and that student progress and their unique rates of learning are taken into account. The Governor asked for input on how we could improve evaluation systems and how teachers’ work could be measured. When asked how he applied measurement in the medical field, the Governor gave great examples of how doctors’ mortality rates and other expectations with regard to patients were measured taking into account the illness of the patient and other factors. 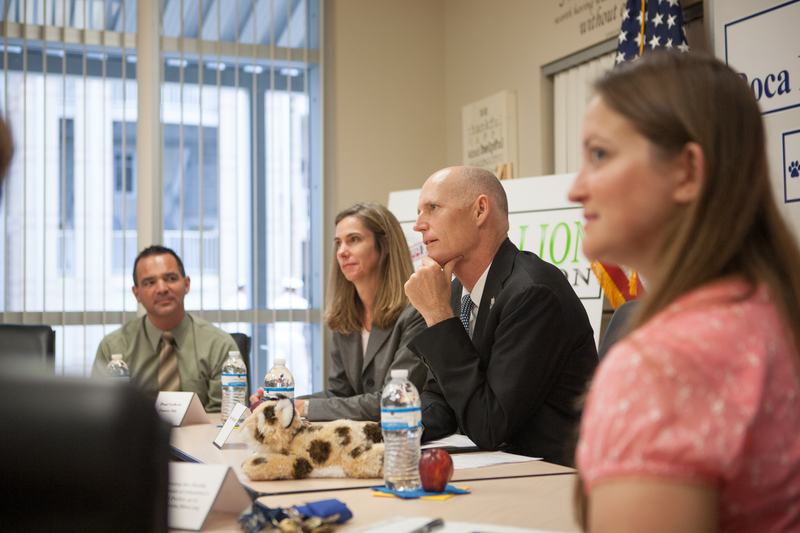 The Governor stressed that he was looking for good ideas and solutions to improve the education system in Florida. Today I had the honor of participating in a 9/11 Memorial Service at Southwest Miami Senior High School with the Student Council and Army JROTC – Eagle Battalion cadets. These students did a phenomenal job of honoring those individuals who lost their lives on that tragic day 11 years ago. While touring classrooms and speaking with students, I realized that they were just as engaged and active in education as their parents and teachers. These students asked great questions and were well informed about what is happening in their school and across the state. I think it is important that we as educators, administrators, and decision makers remember that while we want what is best for our students, we should also listen and understand what their educational wants and need are. We must keep our students actively engaged and informed about education. Our discussion with the students and teachers at Southwest Miami Senior High is proof that Florida is headed in the right direction. Pinedale Elementary has P-A-N-D-A Pride! It was great visiting with the teachers, parents, and students of Pinedale Elementary, “Home of the Pandas,” in Jacksonville, Fla. Governor Scott and I had the opportunity to hear from several teachers who were able to share their thoughts and ideas openly on improving Florida’s education system. Shortly after our teacher meeting, we toured the afterschool program that serves more than 150 students. Whether the children were participating in activities, reading a book, or finishing up homework, it was clear that the students of Pinedale Elementary had a strong support system behind them motivating them to be successful. As our afternoon at Pinedale began to come to a close, we sat down and spoke with a group of parents. After only a few minutes of discussion, I noticed how much these parents loved their students. I could hear the passion in their voices; these parents want what is best for the students of Pinedale Elementary and are great advocates for this school. This was such an inspiring event and I can’t wait to continue this tour with Governor Rick Scott.